Facebook is ready to challenge Google and Twitter for control of real-time news search and the news itself. Starting today with a rollout to US English language users, Facebook Search will return anything you’re allowed to see from its 2 trillion posts. That includes public posts by all people and Pages, not just your friends and Pages you Like as before. The personalized results will be broken up to highlight posts from trusted news sources, followed by people in your network, lists of the most popular links or quotes about a topic, and then strangers. Similar to how Twitter Search works, this move unlocks all the news and chatter shared on Facebook around big news stories and live events, but with a more human focus. Not only could this make Facebook a place people look for perspectives on the news. It could in turn inspire more people to post publicly about what’s happening in the world, since there will be more ways to discover that content than in the feed. Plus, as Google has proven, search queries indicate intent, which can be used to sell highly lucrative keyword advertising in sponsored search results. Facebook’s VP of Search Tom Stocky admitted to me that it’s not focused on monetization yet, but “Because the business model for search is so well understood, we know it will come when it makes sense.” Considering Facebook already processes 1.5 billion search a day, there’s plenty of chances to earn some money. Facebook search began as just a way to find potential friends or visit their profiles. Then Graph Search let you find businesses, photos, and movies on the web, and later mobile (it will still work). Finally late last year, Facebook’s engineering team surmounted the massive challenge of indexing all the individual posts to enable keyword search. But results only included posts that could have appeared in your News Feed. Along the way, Facebook experimented with some search ads, like showing competing games when you searched for a specific game like FarmVille. But Facebook eventually shut those tests down as it concentrated on making a search experience people wanted to use again and again. Today’s update gives Facebook a holistic internal search engine. Before, it was good for nostalgia, looking up funny things friends said or cool photos they posted. Now, it’s a discovery engine for real-time news that’s just slipped out of the future into the present. To help familiarize users, the search drop-down typeahead will now suggest popular keyword strings that complete what you were searching for, while matching people or things will appear below them. Once you’ve chosen one or entered, you’ll get a results page personalized based on around 200 factors including what you Like and engage with, what you’ve searched for, and info about your identity. Rather than just give you an unadulterated list of the most relevant links or mentions like Google, or a highlights or live feed of chatter like Twitter, Facebook breaks up its results screen into several sections as you scroll down. Stocky tells me it works off of the same technology as Facebook’s Trending Topics. To give you an overview of the news, Facebook first surfaces a summary of a topic when possible. Then it shows mentions by trusted news sources like CNN. A special Facebook team that looks at engagement, spam reports, and more determines a reputation score for each outlet or reporter, which the search engine uses to rank posts. Because what friends are saying is often interesting, posts by people and groups from your network are displayed next. Then there are aggregated counts of the most popular links related to the topic, almost like a tiny Digg inside Facebook. Finally, the public posts by people you don’t know are shown, but ranked to seem as relevant to you as possible. 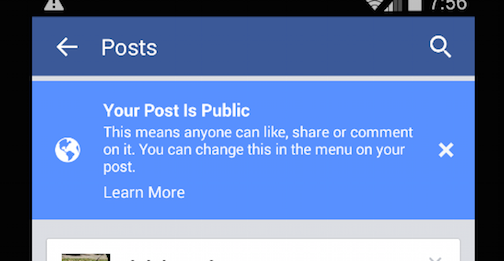 Though the privacy of people’s posts isn’t changing, everything you’ve ever said will be much easier to find now. That means an off-color joke from years ago and the wrong privacy setting could combine to get you in trouble with your employer. I think Facebook could do more to communicate to users that they should go back and check what they’ve shared publicly, run searches on their own name with some offensive terms, and hide anything problematic from the public. At least Stocky tells me Facebook will give you a heads up the first time someone Likes or engages with one of your posts through search, reminding you that people can find this kind of content now. While before you could bet strangers wouldn’t go to the trouble of trawling through your profile for anything irresponsible, search means people need to be more careful with what’s on their Facebook. The new public search feature could combat criticism that Facebook is just an echo chamber. Stocky explains “You don’t just see what your friends and people around you are saying. You see the stories of people on the ground. It gives us a different level of perspective.” While Twitter seems like the default place to share those kind of thoughts today, if people get engagement on their public posts from Facebook Search, they might be more inclined to pontificate on the app’s global stage.